Getting ready for some poolside time or a beach outing? You need sun protective clothing to prevent sunburn and skin damage. And an easy way to do that is with spf swimsuit cover ups. Many women have traditionally used cover-ups as a way to not be so socially exposed in their swimsuits when out of the water. 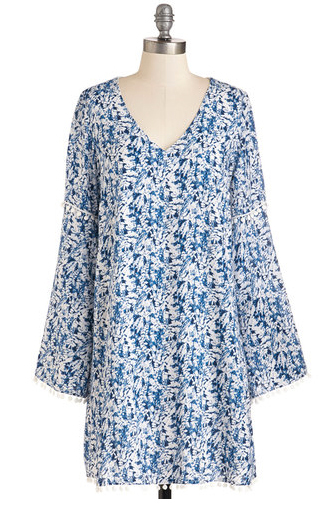 But over time, the variety and style options of cover-ups has grown — and we love it! You don’t even have to have the label of “cover up” to make it work. And that’s what we’ve got here — some unique styles and types that are easy to get. One of the things we love to do is to find throw-on shift dresses that you can easily slide into and use as swimsuit coverups. This one is fantastic because it’s made with a lightweight fabric and long sleeves — the longer sleeves protect your arms from the sun and it’s a roomy summer style. Oh so stylish and unique! 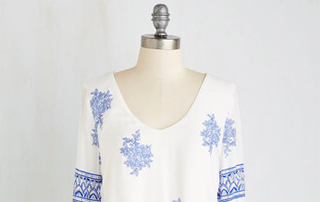 Tunics are also great swimsuit coverups because they usually cover up your bum and have at least 3/4 length sleeves. 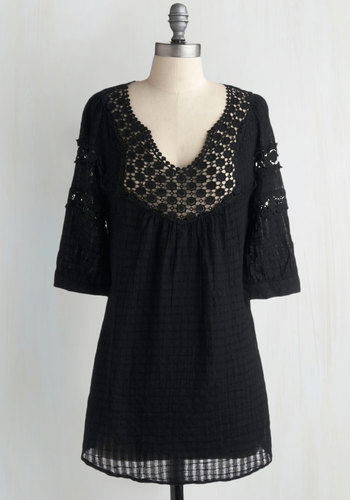 This black, boho tunic begs for there to be some fun swimsuit color through the polka-dotted, see-thru front. 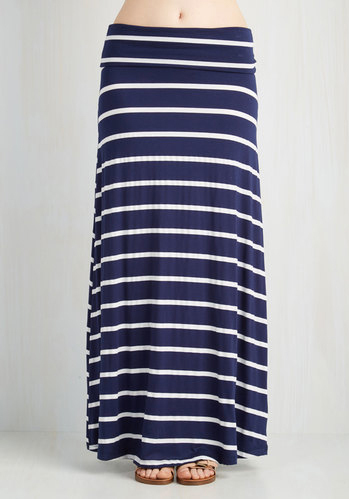 We also like throwing on long maxi skirts — stretchy please! — to cover our legs from the sun, along with a UV protecting mesh jacket. It’s more of a casual look, but with a hat and sunglasses you can look stylish, stay cool, and still be wearing sun protective clothing. 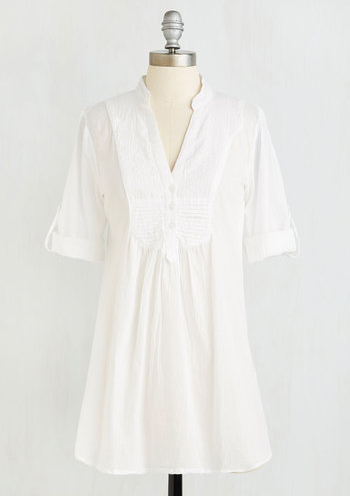 This is a fairly sheer, 100% cotton white tunic. Super summery, fresh look. If you want to lengthen the sleeves, undo the tabbed ties. This swimsuit coverup looks like it was made just for you by Reese Witherspoon. 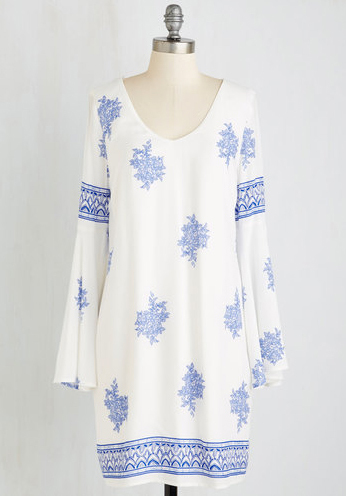 It’s actually a breezy shift dress with an open-crochet back (see the back view at the jump). This is perfect for those kid swim parties when you have to meet moms and dads and look more presentable … but you can still be at the ready to throw off the coverup and jump in the pool on a moments notice. Just a few quick final sun protection tips — even with a cover-up you’ll still want to seek additional shade — 100% UV protecting sunglasses to protect your eyes, a hat, umbrella or canopy, or if you’re lucky a shade tree! And don’t forget nontoxic sunscreen. And here’s a bonus! If you’re still out looking for a swimsuit that fits you just right or isn’t so revealing, check out this “Swim Fashions and Figures” infographic from Modcloth.